Today, I experienced another one of those moments that make me love what I do. It’s not about the glamorous moments speaking to powerful people, but rather the people who are strong in their principles and ideals, make things happen on the ground, and remain humble even while moving mountains. I had the immense pleasure to meet Alberto Urbinati today. He and 8 friends were huge football fans but could not stand the prevalent racism anymore, and wanted to do something practical about it. So 8 years ago, they started Liberi Nantes, a football club for refugees. 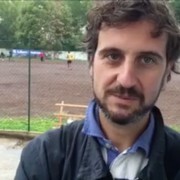 The team consists only of refugees and they are actually playing in the official Italian league. They are pushing for the regulations to allow them to move beyond the lowest league- imagine a refugee Serie A team! I got to spend some time with Alberto and he even invited me to join lunch with him, the players, and the other involved people. It was a special atmosphere – I could feel much he was revered by the players and other team members while he himself remained entirely down to earth and did not accept any special privileges. I was really moved when he talked about his influences, e.g. an annual tournament without referees where it is all about the love of the game and the community, not about winning. This translated into the spirit of Liberi Nantes, in which every player knows two basic rules: smile and respect people – even in the face of hate speech or racism. I wish I had all of our conversation on video, however, we only filmed a short version. I’ll have the interview with him online soon, until then check out the excellent guardian video above. We’re back! 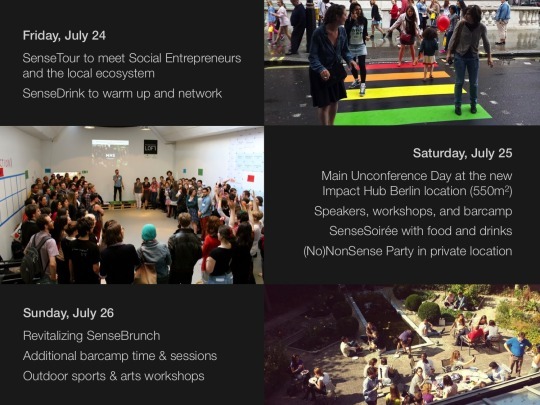 SenseCamp Berlin is taking place from July 24-26 – 3 days of action with the global MakeSense movement! SenseCamp is an unconference for social entrepreneurship and innovation. The highly interactive and community-based event brings together the global MakeSense network and regional ecosystems to boost action and engagement. SenseCamp is the place to discover and exchange new ideas, actionable insights and success/failure stories. And in the evening, you can shake out some moves at the infamous NonSense party! Launched in 2012 in Berlin, SenseCamps have happened all over the world, from São Paulo to Singapore, and have featured speakers such as Prof. Muhammad Yunus, Liam Black, Charles Eisenstein, Rodrigo Baggio, and many more. What is MakeSense all about? Sometimes it’s not easy to keep an overview of all the wonderful videos/tumblrs/articles/links that are part of the MakeSense ecosystem. This is my attempt at a collection. Please feel free to add other links! Is the SenseCamp London 2013 video the best SenseCamp video ever? You be the judge! To date, SenseCamps have happened in Berlin (2012 & 2013), London (2012 & 2013), Paris (2012 & 2013), Kuala Lumpur (2012), Wiesbaden (2013), Barcelona (2013), São Paulo (2013), and Singapore (2013). Other spin-offs include the SenseCube, a co-working & incubation space, CommonsSense, an innovation consulting enterprise, MKS Fest, events that bridge social entrepreneurship and the arts, and Disco Soupe, a movement to fight/dance/cook against food waste. MakeSense has been featured and mentioned in numerous articles, such as e.g. in Wired, the Guardian, Le Monde (french), Libération (french), Youphil (french), etc. In 2013, Christian Vanizette became an Ashoka fellow for co-creating MakeSense – so this global movement will be booming even more now! https://www.projecthires.com/wp-content/uploads/2018/10/logo_web_small-1.png 0 0 dh https://www.projecthires.com/wp-content/uploads/2018/10/logo_web_small-1.png dh2013-11-08 14:04:002013-11-08 14:04:00What is MakeSense all about? awesome playbook from the sandbox network. highly recommendable, lots of great advice for changemakers. nice collection of inspirational quotes by Nuno Filipe Miranda! what is your wish for the city 2.0? share it with TED! openIDEO explained- a platform for collaborative innovation for social good. and there’s quite an active community! jamie oliver’s challenge, for example, received 584 inspirations that generated 194 concepts! seems to incorporate lots of pieces from design thinking– both have quite a lot of potential to create some game-changing innovations for the better. what i like most about pauli is his impatience with solutions that ‘do no harm’ and his insistence on solutions that have highly positive impacts. this kind of broader (re-)thinking highly resonates with me. and it reminds me that i’ll have to write a post on cradle-to-cradle soon.